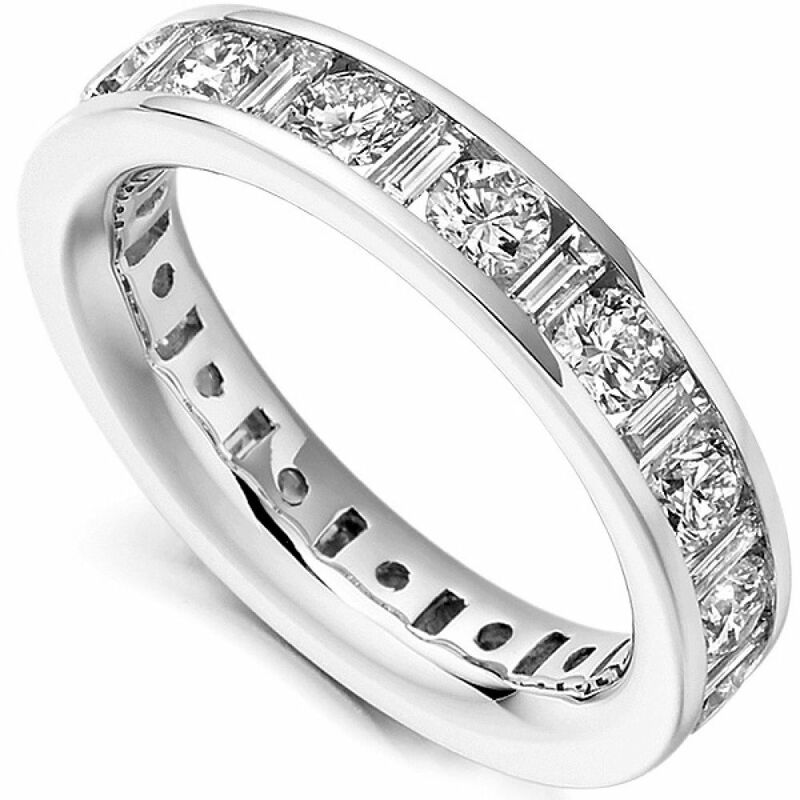 3 carat baguette and round diamond eternity ring featuring a 4.75mm band, fully channel set with 3 carats of dazzling round brilliant-cut diamonds alternating with rectangular baguette cut diamonds. This decadent diamond eternity ring is a perfect example of one of the finest diamond eternity ring designs available, with an impressive show of diamonds. With guaranteed sparkle, this decadent 3-carat Baguette and Round Brilliant cut Diamond Eternity Ring features an outstanding level of brilliance. Enjoy precision setting for a perfect finish. We set perfectly matched Round Brilliant-cut Diamonds—alternating with rectangular brilliant-cut Diamonds into this exceptional Diamond Eternity Ring. The band itself reveals an inner court comfort-fit, ideal for daily wear with a width of 4.75mm. 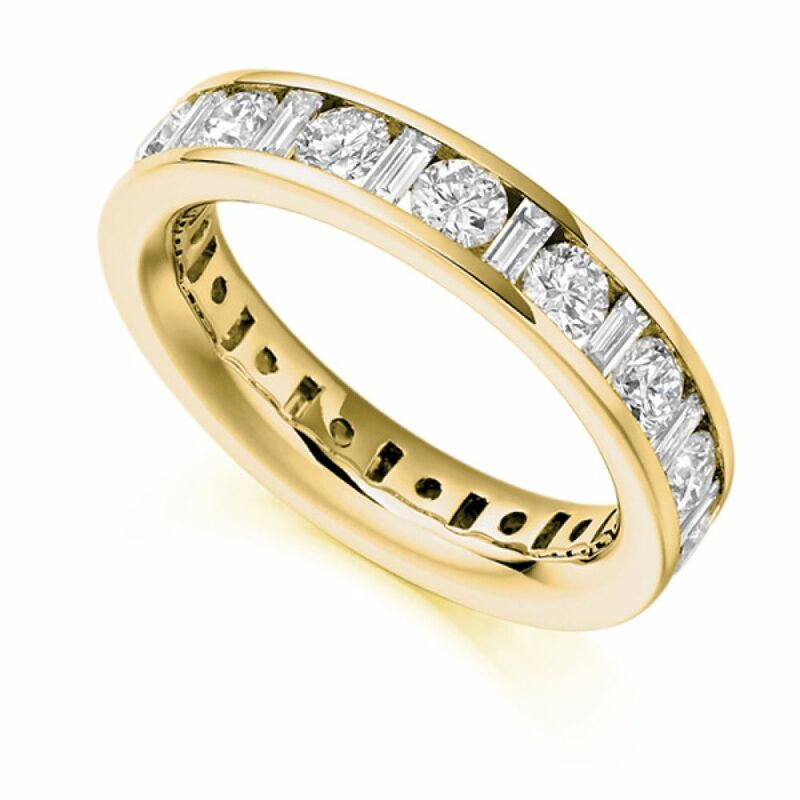 We craft each ring commission to order, working over 4 weeks to create a Diamond Eternity Ring to be truly proud to wear. Enjoy a wide choice of precious metals including 950 Platinum, 950 Palladium, 18ct White Gold, 18ct Yellow Gold and 18ct Rose Gold. 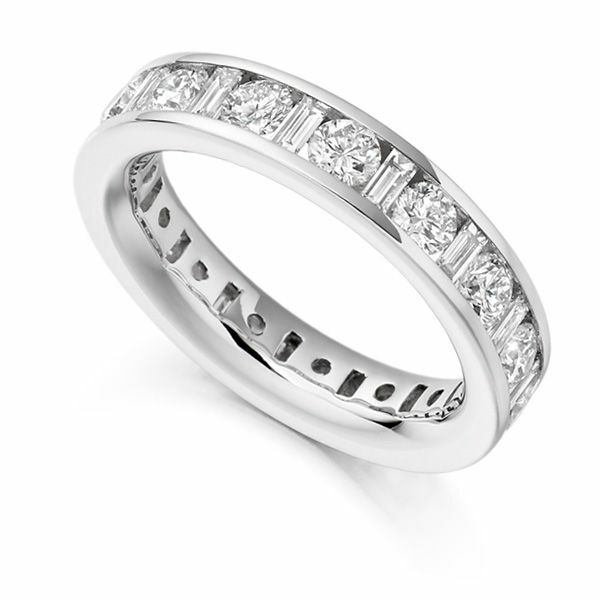 This sparkling ring design makes a refreshing deviation from the classic Round and Princess cut Eternity Ring styles. Baguette cut Diamonds reveal a more subtle sparkle, nestled between perfectly faceted brilliant-cut Diamonds with extra sparkle for a truly beautiful contrast. Each Diamond is graded F-G Colour and VS Clarity for assured whiteness and clarity. Certification is available without further cost by request at the point of order. Enjoy luxurious packaging with each Diamond Eternity Ring presented in a bespoke Serendipity Diamonds box, securely delivered by insured courier under plain wrapping to your door. We deliver to many locations worldwide and provide full support for any guidance you might require before and after your purchase.